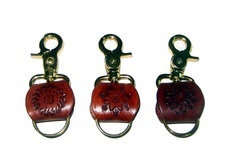 Backed by a team of professionals, we are engaged in the manufacture and supply of premium-quality Handmade Key Chain. They are made using superior-quality raw-materials in compliance with the prevailing industrial quality standards. These key holders are used to store keys. They are sturdy and damage-resistant. They also last for long time periods without getting damaged. These key holders have stamped design on the leather. They are available to clients in various designs, colors and specifications after the approval of quality auditors. These key holders are priced reasonably to suit the client’s budget constraints. They are completely color-proof. 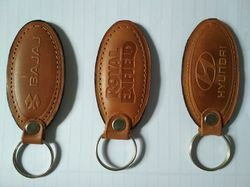 Backed by a team of professionals, we are engaged in the manufacture and supply of premium-quality Handmade Key Holder. They are made using superior-quality raw-materials in compliance with the prevailing industrial quality standards. These key holders are used to store keys. They are sturdy and damage-resistant. They also last for long time periods without getting damaged. 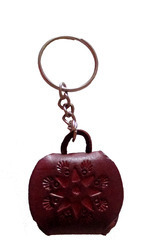 These key holders have stamped design on the leather. They are available to clients in various designs, colors and specifications after the approval of quality auditors. These key holders are priced reasonably to suit the client’s budget constraints. They are completely color-proof. 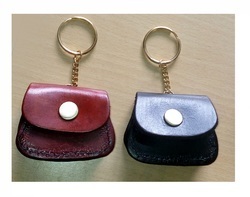 It is Handmade Leather keychain. It is available in customer logo as well. 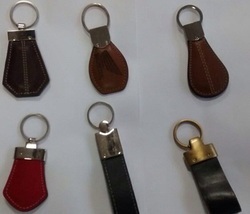 We are the manufacturer and Exporter of Leather Key chain. We will do as per your specification. Custom size and shape available. 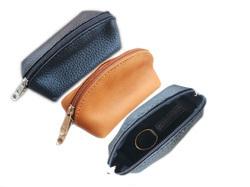 Description : It is made by 100% Handmade leather .And it is closed with zip .It is available in different color.